Nothing beats the smell--or taste--of fresh-baked bread right from the oven. But many home cooks are intimidated by the thought of making their own. 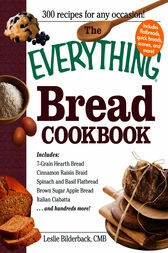 In this cookbook, Certified Master Baker Leslie Bilderback breaks down the bread baking process and makes it easy for anyone to prepare such tantalizingly tasty loaves as: Dark Pumpkernickel Rye; Sea Salt and Herb Fougasse; Cinnamon Raisin Bread; Poppyseed Kaiser Rolls; Cheddar Dill Beer Bread. From breadsticks to pancakes, this book covers much more than the standard "white or wheat" you may be used to. Forget store-bought! With this helpful guide, you'll bake your own bread – and never go back!